Whether your stay is short or long, whether you are on your own or with a large group, you will receive the warmest of welcomes at Áras Ghleann Cholm Cille. We take pride in providing hotel standard accommodation at an affordable price. We have a range of single, double, twin, triple or family rooms available. All are private and en-suite. 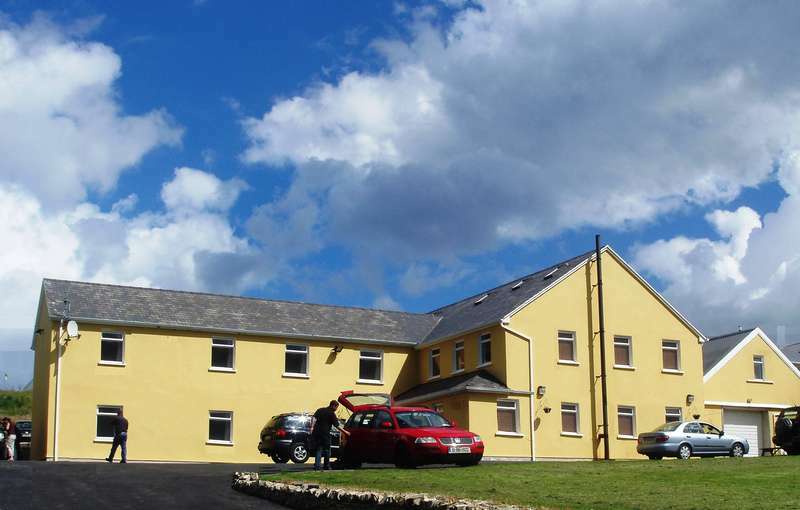 Aras Ghleann Cholm Cille can cater for groups of 50+ persons, each in a comfortable, en-suite modern bedroom. Free Wi-fi is available throughout the building and we also operate a free 24 hr shuttle service to/from the local pubs, restaurants and bus station. As a top rated Donegal B&B you can enjoy a freshly prepared breakfast for an additional cost of only €5 per morning. This can arranged upon your arrival at Áras Ghleann Cholm Cille just by ordering one of our famous Traditional Irish Breakfasts for any morning of your stay. Alternatively you can prepare your own food any time of day using one of our 2 modern self catering kitchens. • A simply stunning South West Donegal location! • Self-Catering or B&B options available. • Fáilte Ireland Approved Accommodation. • Free shuttle service covering local pubs, restaurants, walking routes and Slieve League. • Modern, en-suite accommodation for groups of 50+ people. • A large indoor Hall, facilitating a range of group activities and also providing an all important bad weather alternative. Centre/Pharmacy. When you see the sea immediately on your left, take the first available right turn). turning neither left nor right. You will reach Glencolumbkille (Gleann Cholm Cille) after a further 6 miles. You will see our building just below the hotel.